In my previous post I quoted from my book Truth is The Word that ‘in our day, we have reduced truth to just another aspect of personal or community preference. Relativism and pragmatism rule.’ Relativism is the theory that truth is not the same for all people and that there is no single, unchanging and absolute truth concerning anything. When Pilate asked Jesus, “What is truth?” (John 18:38) he was expressing the still common belief that truth is something very abstract and variable. Your truth is not necessarily my truth but that doesn’t mean that your truth is not as valid as mine – ‘Different strokes for different folks’, as the saying goes. Or, ‘let us all find things to agree on and agree to disagree on everything else’ – another current attitude towards truth. We are all familiar with this approach to truth in the political arena and have heard these concepts put forward in many forms under the banners of tolerance, acceptance, mutual respect, and so on. But would it surprise you to learn that relativism is also common in the church? 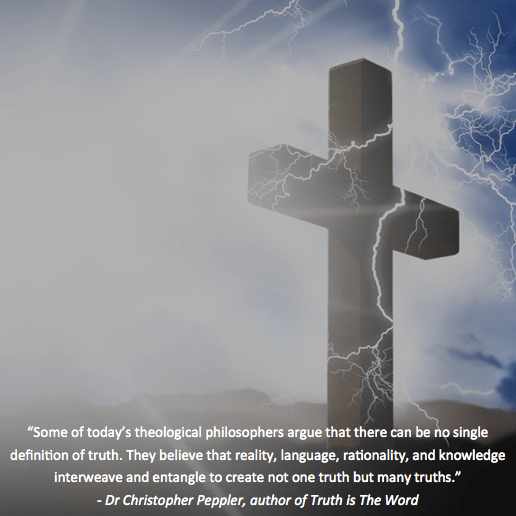 Allow me to quote again from my book: Some of today’s theological philosophers argue that there can be no single definition of truth. They believe that reality, language, rationality, and knowledge interweave and entangle to create not one truth but many truths. Most postmodern theologians regard all knowledge as historically and culturally conditioned. For them, truth does not stand outside of the historical-cultural matrix. In other words, truth is not something eternally fixed and revealed by God, but rather something that emerges from culture, history, and group agreement. They regard truth not so much as objectively ‘out there’, but as a product of communities of language users. This has profound implications for the church. Because of this sort of thinking, many people do not regard the Bible as authoritative. There is no ‘truth’ interface between the church and the world, between Christianity and world religions, or for that matter between one church and another. Everything is relative and subjective. In my next post I will deal with ‘pragmatism’, the second major truth model of our day.